It doesnt matter how hard I try, there are some foods that just don’t look very pretty on camera. This is one of them. But don’t let that put you off, this is one yummy meal that has definitely made it to ‘all time family favourite’ status. Everyone loved it. I got this idea from one of my best friends Jess. She is an amazing cook and wonderful homemaker. We often text each other pictures of our culinary creations. She messaged me the other day with news of her latest kitchen triumph (slow cooked pesto chicken) and I knew I had to try it out! I had some leftover Clean Eating Kale, Walnut and Basil Pesto from a big batch I made up earlier in the week and wanted to try something new with it, so that’s exactly what I did. 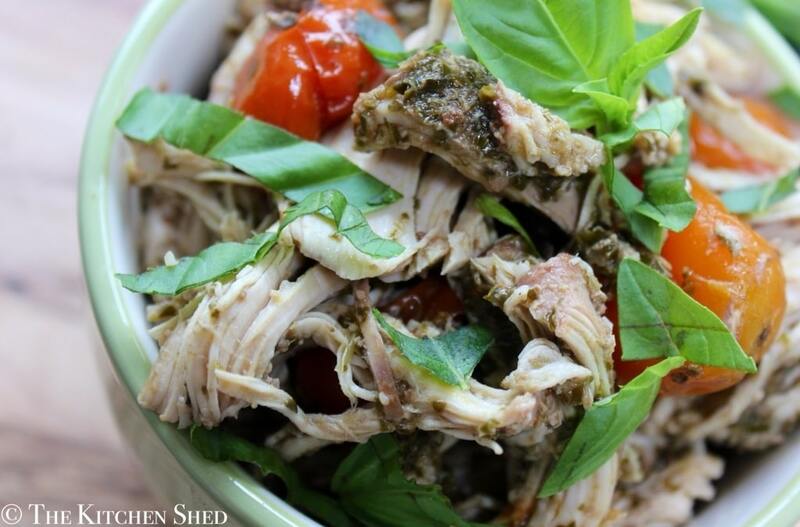 Clean Eating Slow Cooker Pesto Chicken is so tasty! 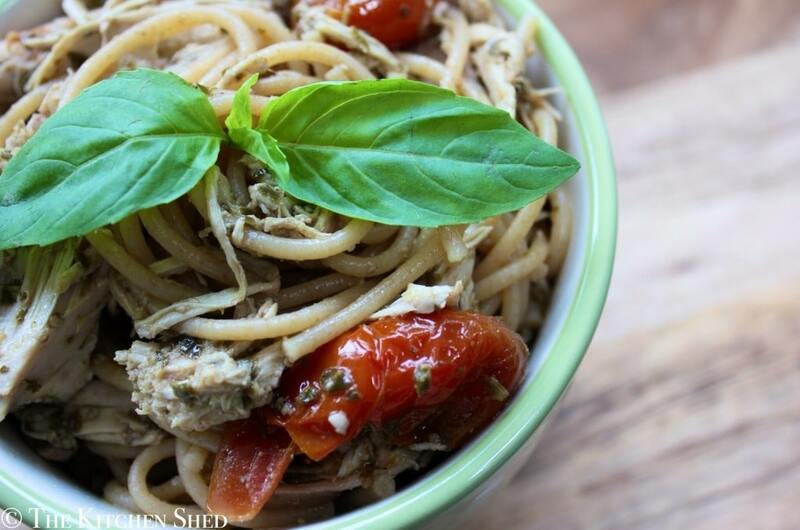 We ate it with some wholemeal spaghetti, but it would be amazing with quinoa, rice, cous cous or potatoes. The cherry tomatoes make great little pockets of juicy goodness and definitely help to brighten the whole dish up! Spread each chicken breast with a tablespoons of pesto. 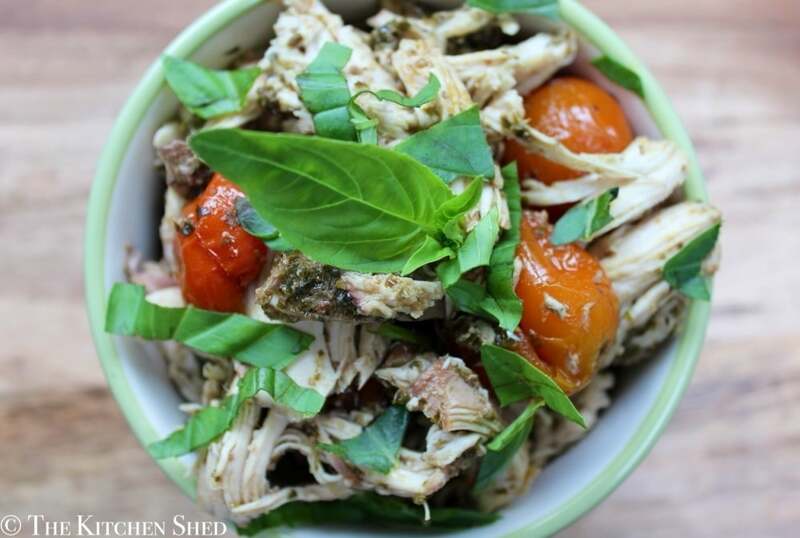 Place the chicken breasts into the slow cooker and place the whole cherry tomatoes around them. Put the lid onto the slow cooker and cook on LOW for 6-8 hours. Once cooked, remove the chicken from the slow cooker and shred with two forks. Place the chicken back into the slow cooker and stir into the remaining juices. Serve with quinoa, cous cous, rice or wholegrain spaghetti and a leafy green side salad. You can add some extra fresh basil leaves too.